"Dalton lives like a loner, fights like a professional. And loves like there's no tomorrow." 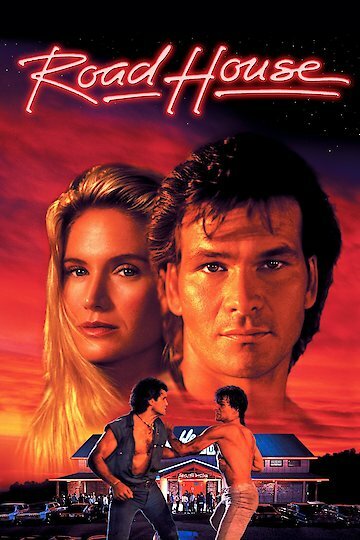 "Road House" is the 1989 action packed drama starring Patrick Swayze as a famous bar bouncer. Swayze plays James Dalton, who is sought out by a desperate bar owner to help save his business that is suffering losses due to employee theft, ineptitude and a violent clientele. The bar owner makes Dalton an offer that he can't refuse and Dalton heads to Missouri to help save The Double Deuce bar. Dalton is clearly a loner. He rents a one room apartment atop an isolated barn and spends his time doing yoga and performing martial arts exercises. He goes right to work at The Double Deuce firing several employees who were under performing, stealing, acting out violently and dealing drugs. Dalton starts running the business and things start to improve. It later is revealed that a local business man, Brad Wesley, had financial interests in The Double Deuce that Dalton has negated by making changes in staff. Wesley's nephew was one of the terminated employees and he sets out to get revenge on Dalton and The Double Deuce. During one violent altercation with a drunk customer, Dalton is stabbed and goes to the hospital for treatment. It's there that he meets Dr. Elizabeth Clay who quickly becomes smitten with Dalton and his tough as nails demeanor. Later, we are introduced to Dalton's mentor, Wade Garrett. Garrett stops by for a visit and soon gets more involved with Dalton's battle with Brad Wesley. After Dalton suffers an unexpected and tragic loss at the hands of Wesley's men, Dalton does battle with the evil Wesley and his henchman. In the process he suffers a serious loss. It ends up that he doesn't have to battle alone. He receives the support of all of the townspeople who are sick of being pushed around by Wesley. The final battle scene stands out with an action packed fighting sequence that rivals any other. "Road House" was an original and ground breaking film that spawned several copycat films. The film was a break out performance by Swayze. The all-star cast also included Sam Elliott, Ben Gazzera, Kelly Lynch, rock star Jeff Healy and professional wrestler Terry Funk. Road House is currently available to watch and stream, download, buy on demand at Amazon Prime, Starz, Amazon, Vudu, Google Play, iTunes, YouTube VOD online.